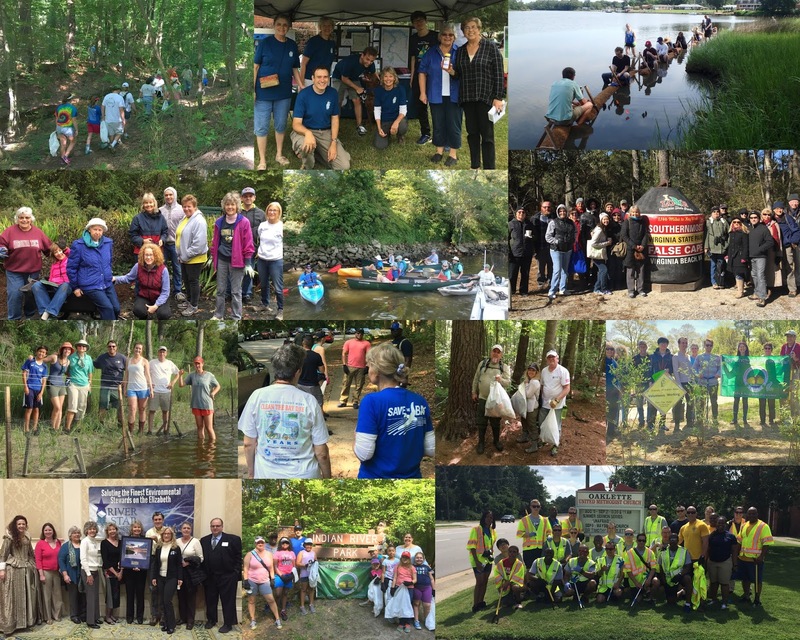 90+ volunteers put in nearly 1200 hours on projects including cleanups, gardening, outreach, and coordinating with partner organizations. 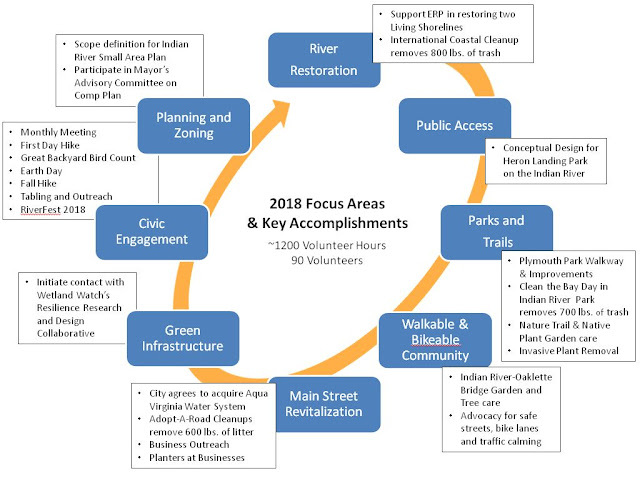 Many additional volunteers were engaged by our partners for projects they spearheaded, including several by the Elizabeth River Project. 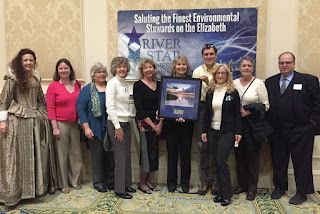 Friends of Indian River recognized as Model Level River Star Organization by the Elizabeth River Project at their annual River Star Business Luncheon. 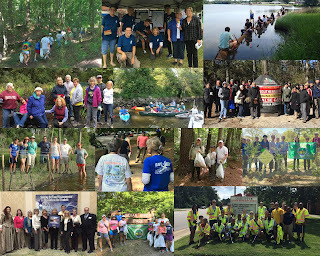 Major events included Clean the Bay Day, the International Coastal Cleanup, and RiverFest. Significant progress at Plymouth “Community” Park and in planning for the new waterfront public access park to be named Heron Landing Park. 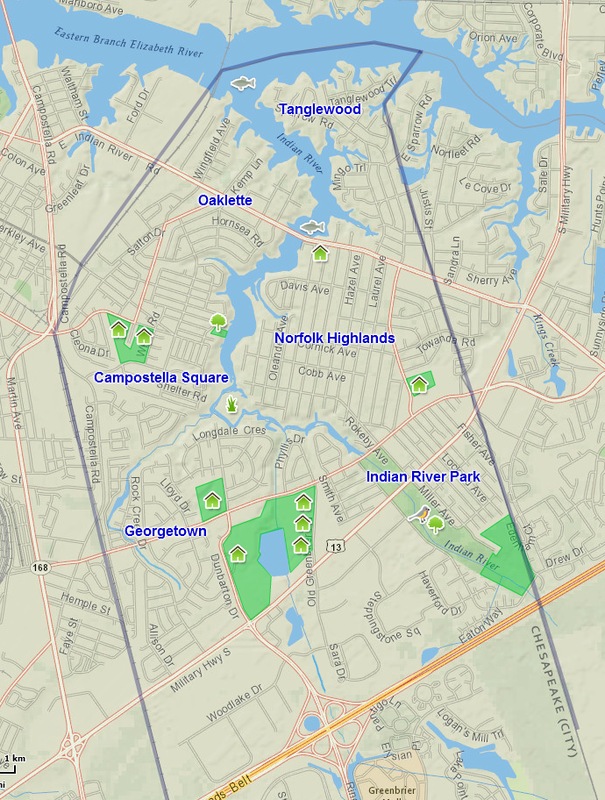 And, perhaps the biggest news for the community was the agreement for the City to buy out the Aqua Virginia Water System in the neighborhood behind, and including, the Indian River Shopping Center. That acquisition should be completed in 2019 and we’re hoping it enables some major revitalization along Indian River Road. The biggest news on “Main Street” is the contract for the City to purchase the Aqua Virginia Water System in our area. This deal will switch about 500 homes and the Indian River Shopping Center off of the antiquated, privately held, well system to the City water supply. This will improve reliability and quality of the water supply. The City will then also upgrade the substandard water distribution piping in the eastern half of that service area (generally east of Sparrow Rd) while doing previously planned upgrades to the sanitary sewer. Fire hydrants will be installed and the City will be able to provide water to the Indian River Shopping Center for fire suppression/sprinkler systems; this has been a critical roadblock to any potential redevelopment of the shopping center. The contract between the City and Aqua Virginia has been signed and the petition to approve the transfer has been filed with the regulatory agency, the State Corporation Commission (SCC). We are expecting the sale and transfer will close in early 2019. The revitalization of the Indian River Shopping Center is one of our major goals. But, this goes hand in hand with fixing up all of Indian River Road, our main street. 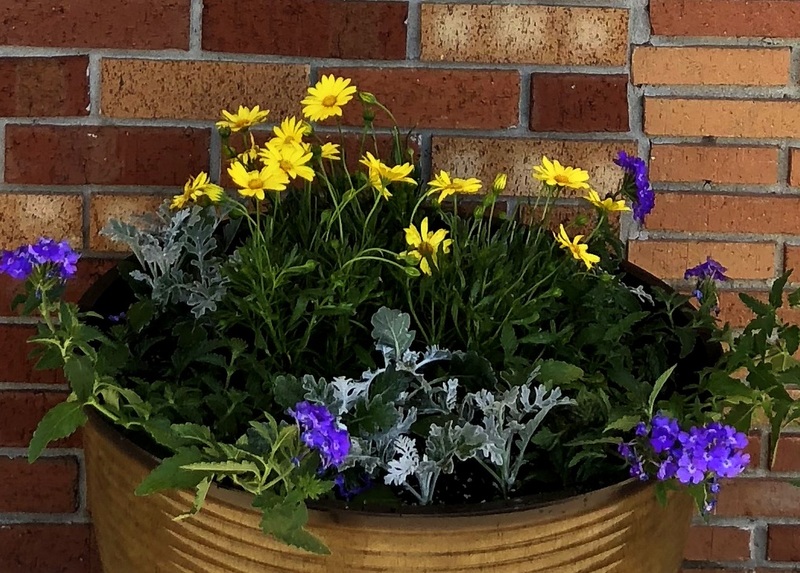 We continue to engage local businesses and thanks to the generous support from local commercial property owners including Larry Barlow and Bettina Colonna Essert, we've placed flower planters at the Irwin's Shopping Center, the Trade Team Business Center, Papa John's, and at Lulu's Hot Dogs. 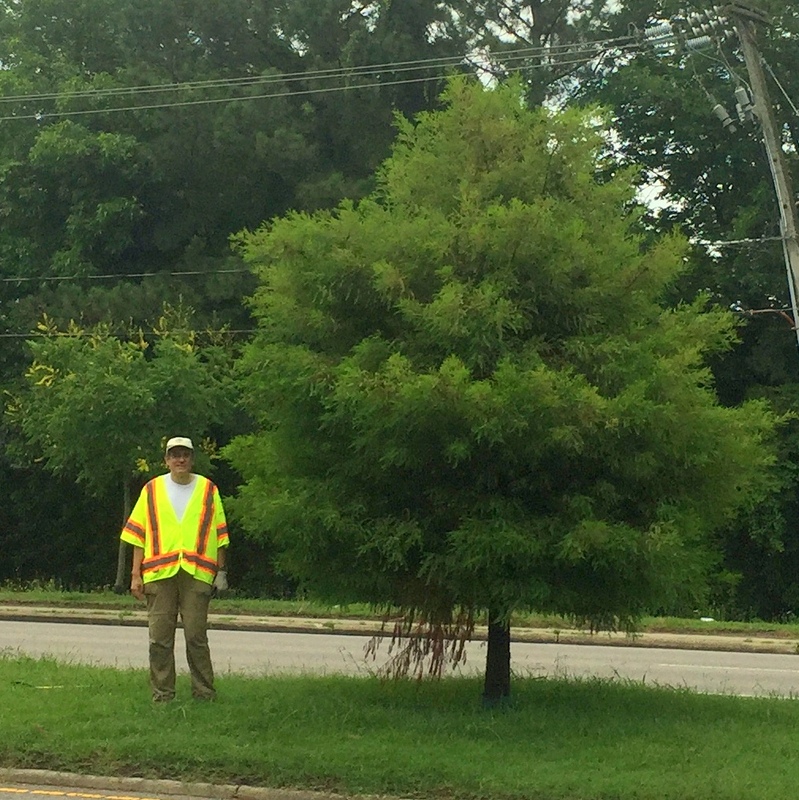 Our dedicated volunteers also continue our quarterly roadside cleanups along Indian River Road. 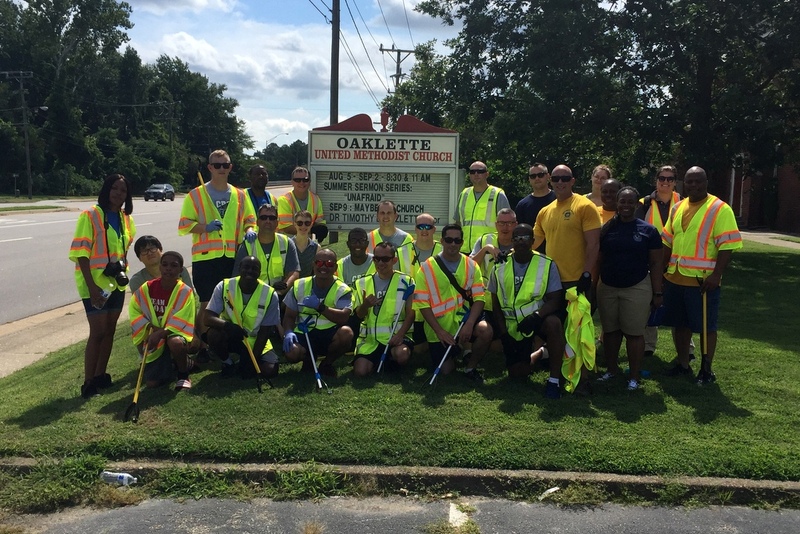 Thanks to help from the Elizabeth River Project and sailors from the USS George Washington (CVN 73), we even squeezed in one extra cleanup during the summer. Altogether the teams picked up about 600 lbs. of litter - cigarette butts, cigarette filter tips, cigarillo wrappers, ketchup wrappers, bottle caps, straws, food wrappers, take-out containers, bottles, cans, plastic bags, etc. - along the roadway, the bridge, and the public right of ways. While these cleanups help keep our community from looking trashy, we realize they are not sufficient. Plastics in particular are a growing problem with micro-plastic particles now finding their way into the food chain. Ultimately the Friends support efforts kick the plastic habit. It starts with folks saying “ No” to single use plastics whenever and wherever possible – it is up to all of us to change this culture. In September, 13 volunteers embarked in canoes, kayaks, and a skiff for the International Coastal Cleanup on the Indian River. This was our first ever waterborne cleanup and together they pulled out over 800 pounds of trash including tires, ghost crab pots, a large tarp, plywood, hundreds of bottles, cans, plastic bags, and a surprising assortment of children’s toys. 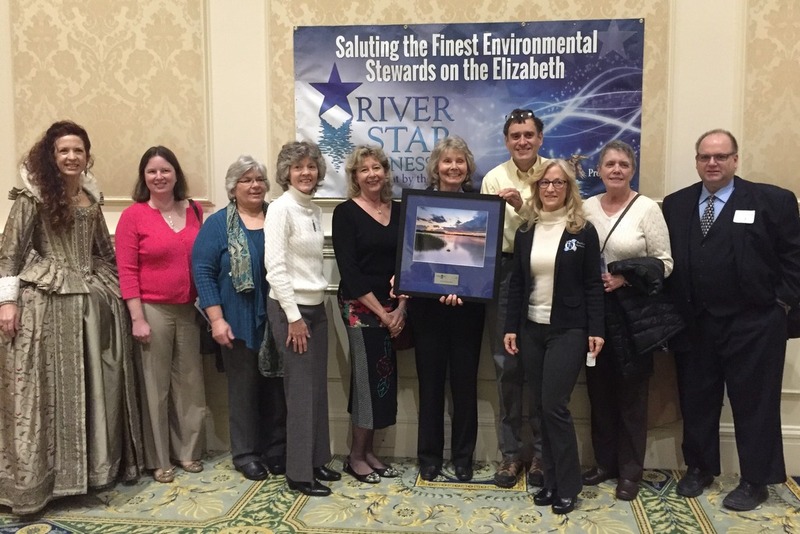 To deal with the more long term issues of water quality and erosion, the Friends also supported the Elizabeth River Project as they worked on two shoreline restoration projects along the Indian River, each one breaking the record for the longest shoreline project performed by the organization. 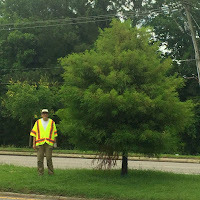 In June, the Elizabeth River Project brought in about 120 volunteers to install a living shoreline just north of the Indian River Oaklette Bridge. 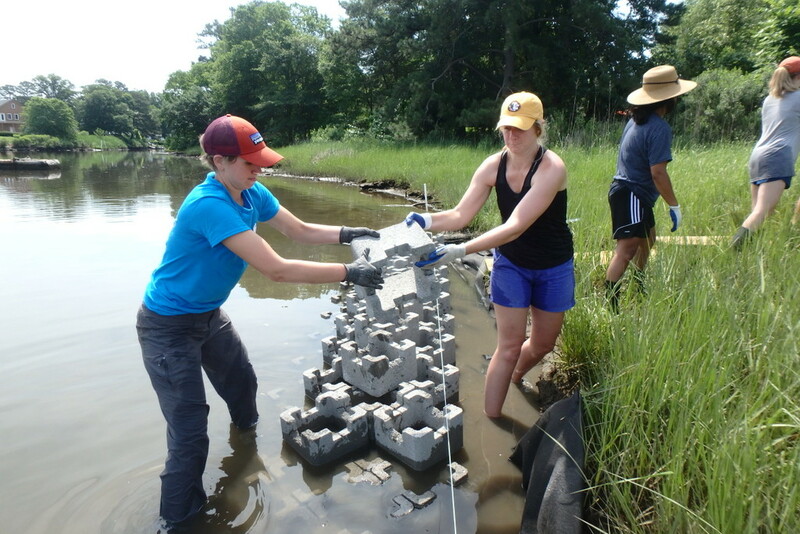 Over several weeks, the volunteers installed 800 oyster castles, 40 bushels of oyster shell - provided by the Chesapeake Bay Foundation - and over 5000 Spartina marsh grass plugs to create 670 feet of habitat along this shore. In the fall they started work on a second project a half mile further north that added over 3200 oyster castles with more marsh grass planting planned for the spring. 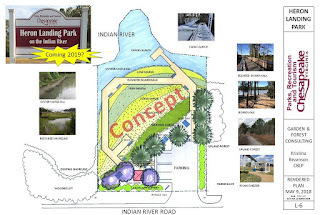 Early this year, the Friends worked with the City’s Parks, Recreation, and Tourism (PR&T) department on design plans for the future canoe/kayak and fishing site along the Indian River. Just off Indian River Road, the park will be the first true public access site on our river. 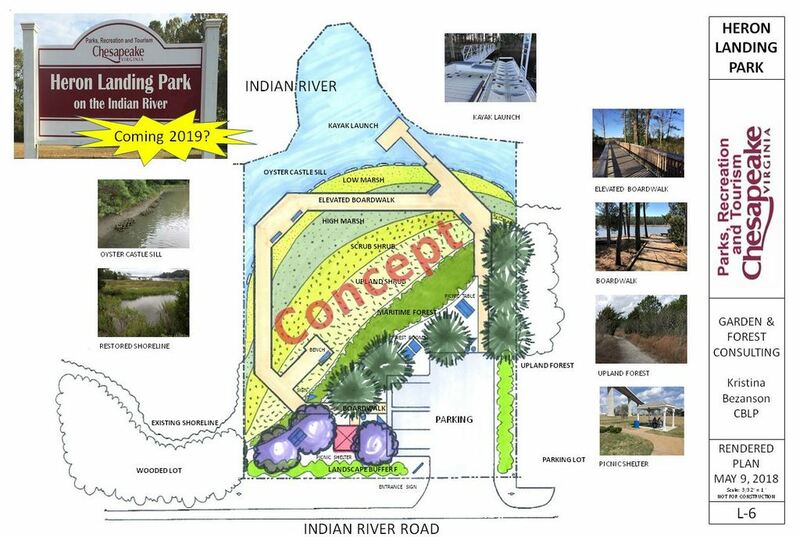 The proposed name is “Heron Landing Park on the Indian River”. 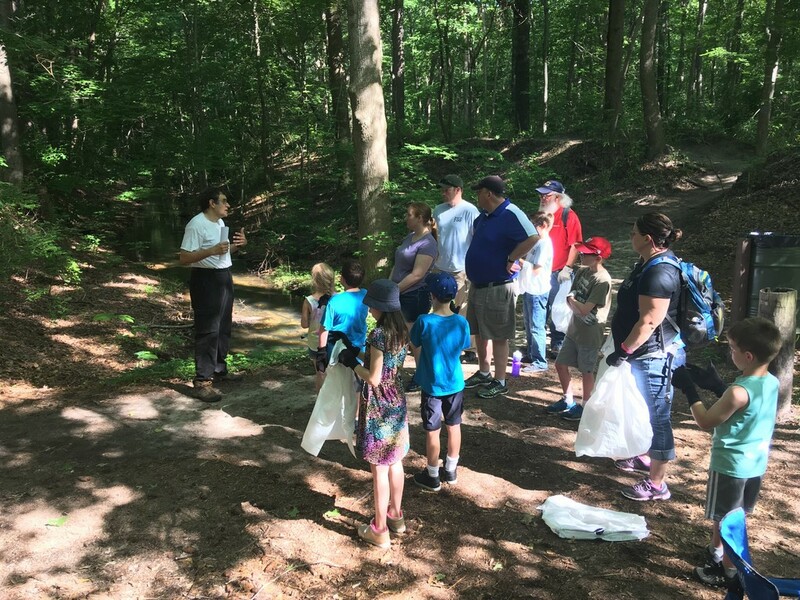 George Washington University graduate student Kristina Bezanson led the group, including participants for PR&T, the Friends of Indian River, the Elizabeth River Project, and Wetlands Watch, in creating a conceptual site plan for the new park. After evaluating the site and the condition of the existing hardened shoreline, the group recommended that we tear down the old seawall and rebuild the site with a natural shoreline and a boardwalk to provide access for fishing, wildlife viewing, and launching canoes or kayaks. The plan is very ambitious but will provide the community with a first class waterfront public access site, while improving water quality and habitat. The City conducted engineering studies in the fall and is including the park effort in their 2019 funding request to the City Council. 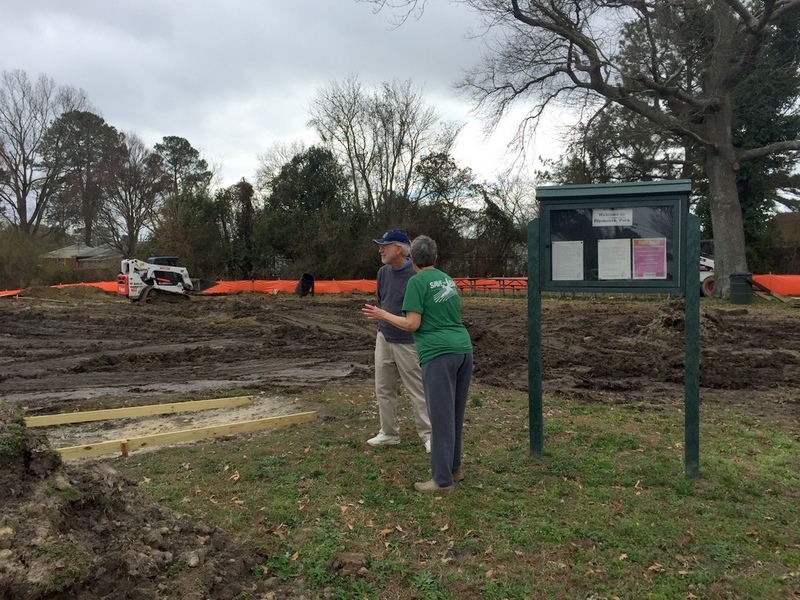 Further upriver, the Friends have been working with PR&T to improve the long forgotten community park of Plymouth Park in the neighborhood of the same name. The Friends adopted this park a couple of years ago starting with a major cleanup on Clean the Bay Day. Since then we’ve been working to turn this park from a little used field into an amenity for the neighborhood. Major steps were taken this year as PR&T installed a paved walkway and a new picnic table pad, along with new tree plantings. New wooden guardrails were installed along the street. And the Friends planted blueberry bushes donated by the Chesapeake Master Gardeners for Earth Day while Daisy Troop 29 planted flowers around the main park sign. The City has identified additional grant funding to install a playground in the park in 2019. Meanwhile at Indian River Park, our flagship park, we had 84 volunteers for Clean the Bay Day in June. This was the first time we focused on the Ipswich area at the south end of the park - the headwaters of the Indian River – and the cleanup teams hauled out 700 lbs. of trash. Throughout the year, volunteers maintained the native plant garden at the trailhead entrance area and the nature trail. Another ongoing focus was combating invasive species, particularly English Ivy and Japanese Stilt Grass, with both group and individual volunteer efforts. Contact us to learn more about joining our RIP (Remove Invasive Plant) teams. Volunteers have continued upkeep on the flower gardens and trees in our Adopt-A-Spot program on the approaches to the Indian River Oaklette Bridge. The bald cypresses in the central median are maturing nicely and the plum trees on the south median add a beautiful color backdrop highlighted by the flower gardens at the bridge corners. This gateway area for our community will also provide an important tie in to the future Heron Landing Park. Heron Landing Park is a relatively small property and since we don’t want to turn it into a big parking lot, it will primarily be a walk-in park. Even today the site is a popular, if unofficial, fishing spot and even though it has absolutely no parking today. 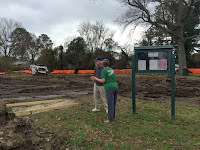 When it opens as a City park, many people will be walking and biking to it from the surrounding neighborhoods and we are working to make sure there is safe access. This also ties into the overall goals to improve walkability within the community. We recently reached out to Wetland Watch’s Resilience Research and Design Collaborative. 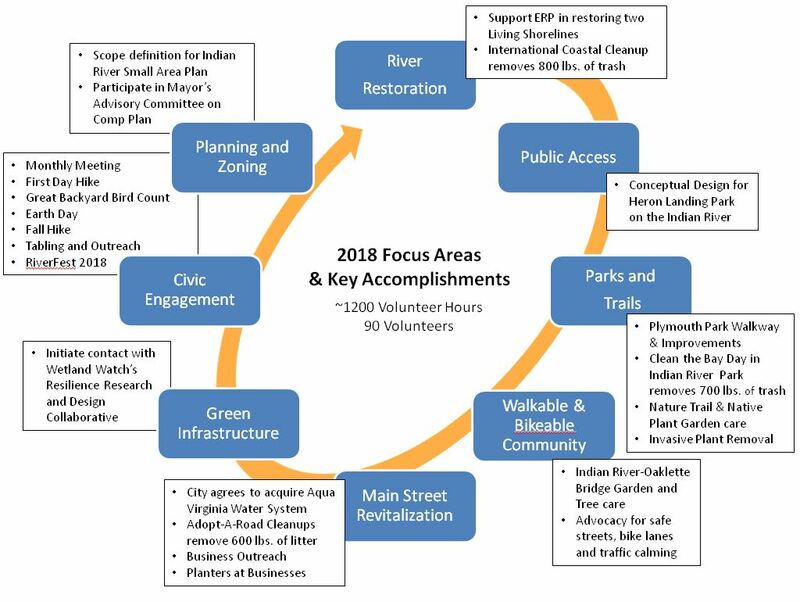 This is a joint project of Wetlands Watch, Virginia Sea Grant, and the Green Building Council that links research and education programs at Virginia universities with local governments to perform adaptation research and design studies. One such recent study in the Chesterfield section of Norfolk resulted in major funding to deal with local flooding. Meeting with Ross Weaver from Wetlands Watch, we toured the Indian River neighborhoods looking at potential projects ranging from dealing with sea level rise in Tanglewood, ditch flooding in Norfolk Highlands, water quality improvements in the stormwater lake at Indian River High School, traffic calming, walkability and public access to natural areas, revitalization of the Indian River Shopping Center, and more. We’re looking forward to working with the “Collaboratory” in the coming year to see if any of these can be turned into study projects. The Friends supported a resolution that disallows computer-based gaming establishments within the City. The City passed this Ordinance in January but several computer-based gaming establishments, including at least one in Indian River, continues to contest this zoning decision in court. The Friends continued to follow the plans to build condos on the 17 acre wooded lot at the end of Miller Avenue adjacent to Indian River Park. The condo development, now being called Fieldstone at College Park, was originally approved ten years ago in 2008 but was never started. This year, the site was purchased by a new owner and a site plan for the project was submitted to the City in October. The site plan was sent back to the developer for revision because it did not provide the 25' vegetated buffer to the residences on Miller Avenue required by the proffers on the zoning approval nor did it meet the required 15% tree canopy (2.7 acre) requirement. At the time of this writing, a revised site plan had not been submitted. The public engagement to start developing the Small Area Plan is expected to begin in 2019. 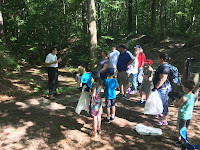 We organized several hikes including a First Day Hike at Indian River Park, the Great Backyard Bird Count, and a fall hike at Indian River Park. We held an Earth Day Event at Plymouth Park that included a cleanup and planting of blueberry bushes. Our biggest outreach event of the year was RiverFest which was held in our community for the first time ever. We also tabled at the Chesapeake Environmental Improvement Council Annual Awards Luncheon, Norfolk Naval Shipyard Earth Day, Chesapeake’s KayaXpedition Festival in partnership with PR&T and REI, Norfolk Highlands’ National Night Out event in August and the Oaklette United Methodist Church’s Harvest Exchange over the summer. The Chesapeake Bay Foundation invited us to co-host the screening Earth, Air, Water, Fire, The Human Element by award winning photographer James Balog held at the Sandler Center. 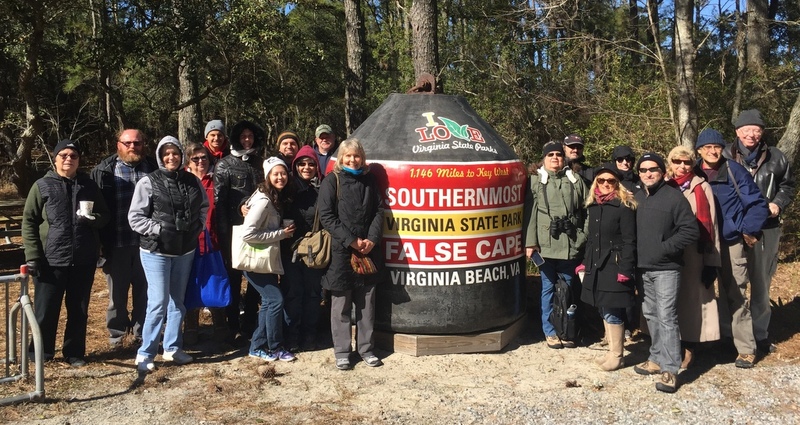 This year's members' education field trip went to the Back Bay National Wildlife Sanctuary and False Cape State Park for their Winter Tram Tour for a guided tour of the area's wildlife and history. Over the summer Rogard Ross, one of our founders, was nominated for the Cox Conserves Hero Award. Sponsored by Cox Enterprises and The Trust for Public Land (TPL), the award is to “honor the unsung heroes in our communities, as well as support the local organizations doing the important work of improving our environment”. 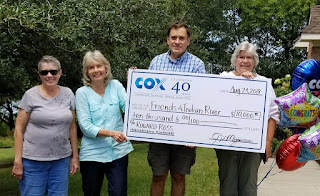 Rogard was selected as the Virginia winner by a judging panel who reviewed the numerous local area submissions, and with this the Friends of Indian River received a generous $10,000 donation from the James M. Cox Foundation. Rogard then also competed for the nation-wide Cox Conserves Hero Award which is based on a popular vote on the Internet spurring us to an exciting #VoteForRogard campaign. 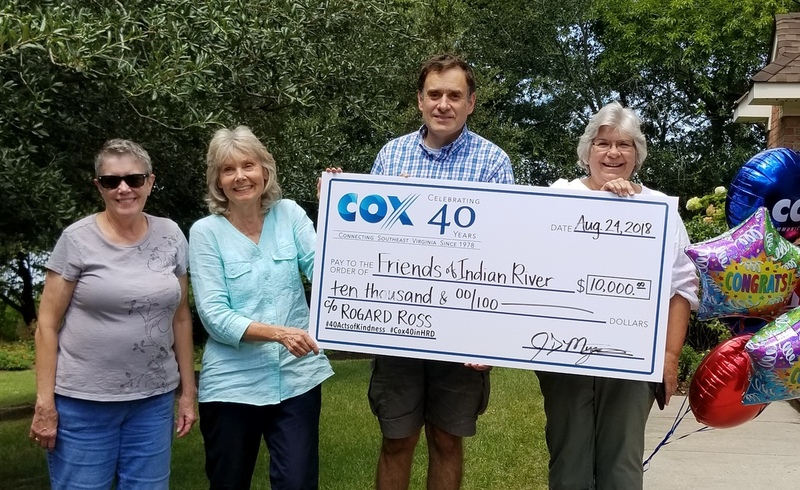 We were blessed with an outpouring of support and numerous favorable testimonials made by individuals and groups in support of Rogard and Friends of Indian River. Ultimately, the national winner was a very deserving California nominee but the entire process was still a great boost for our organization. The Friends are now carefully considering how to maximize the benefit of $10,000 Virginia award. This will be a key topic of our January Annual Meeting. So, please join us at our Annual Meeting on Thursday, January 17th, at 7 pm at Oaklette United Methodist Church, 520 Oaklette Drive, Chesapeake, VA, as we hold election for our board and review plans for the coming year! 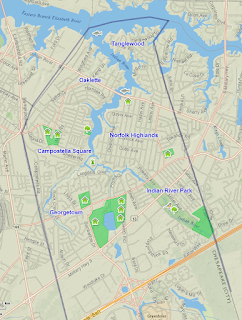 Hi everyone - with the forecast of rain Friday night and Saturday morning, we are cancelling the planned Adopt-A-Park Volunteer Work Day (Invasives/English Ivy Removal) on Saturday 12/15. We are rescheduling this event to Saturday, January 19th. But please join us for Annual Holiday Party next Thursday, 12/20 at 7 pm. It's a chance for us to get together and celebrate the year's accomplishments. Bring a holiday treat (like vege platter, appetizer, or dessert} to share and join us for the fun - including a chance to finish your Christmas shopping at our silent auction. Even if you have not been to a meeting in a while or if this would be your very first meeting you are invited. See below for details. 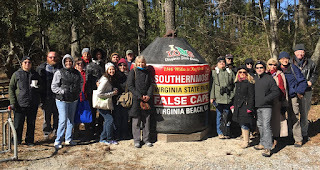 And we are also planning a First Day Hike at Indian River Park on January 1st!.